The fierce, blue-feathered hawk slices through the air with jet-like intensity. 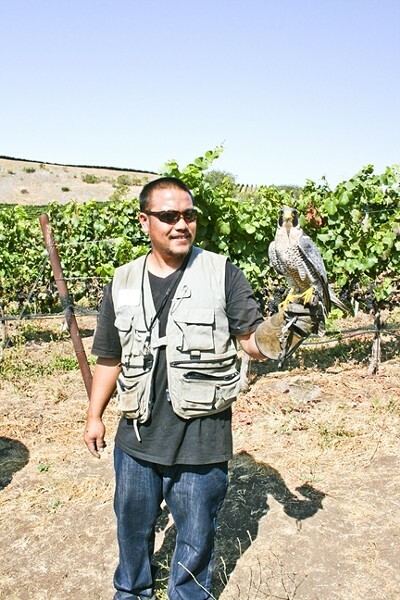 I snap blurry photos in vain as the majestic bird of prey--named Dexter by his gloved handler--swiftly patrols Laetita Winery’s 630-acre Arroyo Grande vineyard. Dexter’s dexterous occupation? Eliminate pesky critters keen on munching the vines, many of which are already heavy with luscious, ripening fruit. The bird’s arrival in the vineyard can mean only two things: terrified rodents and the nearing of glorious, gift giving, frenzied, and fantastic harvest season. Yes, it is just around the bend. VINEYARD PATROL: Dexter the hawk patrols the vines at Laetitia Vineyard and Winery in Arroyo Grande during the harvest season, which is just beginning at the scenic locale. Juicy grapes attract all sorts of pests, but they are no match for this winged watcher. Laetitia Vineyards and Winery Viticulturist Kelsey Ryan narrated the scene on July 31, which saw earlier than usual ripening among about 400 acres of the winery’s signature pinot noir. At about 9:30 a.m., the sun was already blazing, unaffected by a lazy patch of coastal fog hovering in the west. A group of media assembled by San Luis Obispo Wine Country, including writers from LA Weekly and Sacramento Magazine, oohed and ahhed as Dexter nearly gave us a haircut. “Dexter works sunrise to sunset, and he’s definitely busy now,” Ryan said, talking over bleating winery goats used for weed abatement. 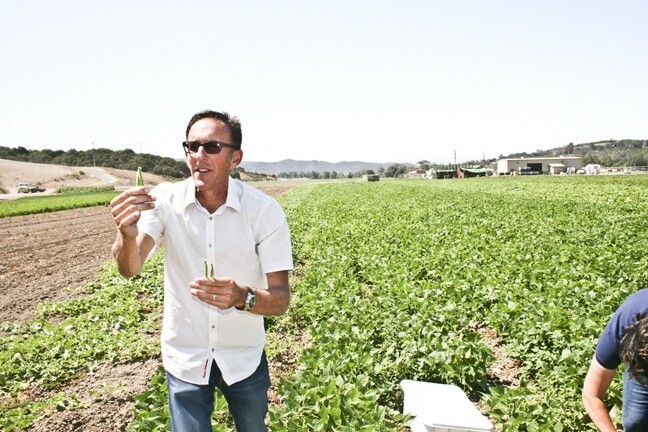 The Cal Poly alum added that it’s interesting to see such ripening before Aug. 1—an observation you’ll overhear at any local tasting room or Farm Supply parking lot. As of the date of this publication, the winery should be underway harvesting grapes for its sparkling wines and will likely be just one week out from plucking chardonnay. At Laetitia, groups of 10 harvesters toil throughout the night (cold temperatures maintain grape flavor and color), hauling in tons of fruit to their on-site winemaking facility. Each Central Coast grower has his or her own way of tackling the most hectic time of year, which, depending on the weather, ends in celebration (and exhaustion) around October or November. Before your eyes glaze over: This isn’t just a story about a single vineyard or farmer. Regardless of what or how Central Coast growers harvest, each is experiencing a common reality: Thanks to a warmer than average growing season across California, ripening—whether in tomatos or tempranillo—is happening earlier than in years past. Several growers told New Times they were anywhere from one to four weeks ahead of normal (of course, “normal” is all relative when you tango with Mother Nature for a living). Paso Robles Wine Country Alliance Executive Director Chris Taranto confirmed the word on the street. 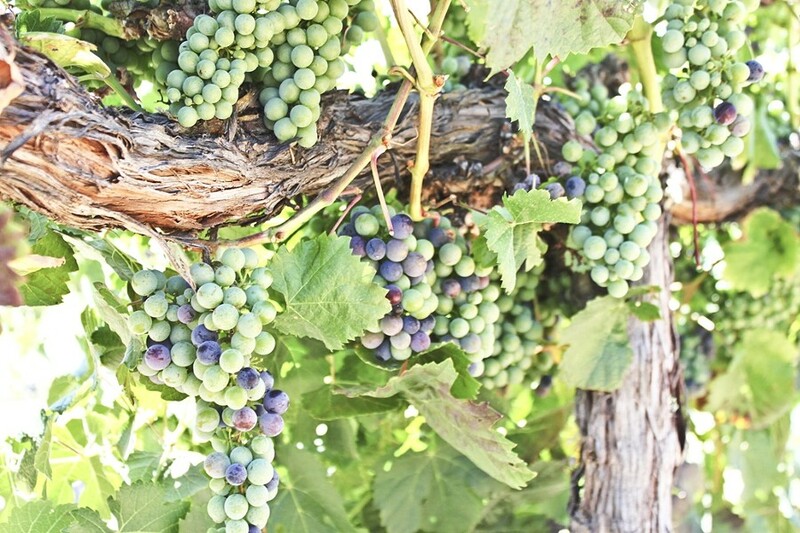 POP OF COLOR: Malbec grapes at Robert Hall Winery in eastside Paso Robles experienced veraison (a fancy word for ripening) on July 7, which puts their harvest about a week to 10 days ahead of schedule. Across the region, grapes are reaching peak ripeness earlier, thanks to an overall warmer, drier growing season. FYI: Veraison simply refers to when the hard green berries turn golden (in the case of white varietals) or purple (in the case of reds). Lisa Pretty of Pretty-Smith Vineyards said this unique ripening process is worth watching. Like a tuft of vivid wildflowers, veraison is only around for a brief, brilliant stay. Art? Oh yeah. Rows of syrah grapes at Robert Hall Winery not only appeared picturesquely purple late last month, but the juice itself boasted surprisingly sugary flavors. I sucked on a few and spit out the gritty seeds. Winemaker Don Brady took a break from bottling to talk about the nearing harvest season, a productive time he favors most. Like in 2013, the winemaker said the new vintage will be influenced by warmer, drier weather. The winery’s sauvignon blanc and chardonnay should be ready to go this week, thanks to what he feels are optimal conditions. The winery is traditionally known as one of the first to harvest in the Paso Robles AVA. Last year, Robert Hall picked its sauvignon blanc on Aug. 15, ahead of any other in the region. He added that “you don’t win anything” by picking first—you just suddenly have more work than your neighbors. PICKIN': Fourth generation farmer Brian Talley of Talley Farms harvested green beans late last month. This year, heirloom tomatoes (included in the farm’s popular weekly CSA boxes) are ripe and ready to eat earlier than usual. Back in Arroyo Grande at Talley Farms, Brady’s statement resonates. On the very same breezy late July afternoon, farm workers picked corn, green beans, and a plethora of colorful veggies ready for chef knives and local kitchens. Rows of pinot noir grapes (used in Talley Vineyards and Biddle Ranch wines) are about three weeks ahead of schedule. “Just as we’re having an early grape harvest, this is the earliest I’ve ever seen heirloom tomatoes,” owner Brian Talley said. The wholesale operation distributes to restaurants and suppliers as well as provides popular Fresh Harvest CSA Boxes to the public. Currently, the farm boasts 2,900 subscribers who tear open the weekly boxes with gusto to devour what’s ripe now. A recent box showcased lemons, carrots, avocado, spinach, cucumbers, yellow squash, oranges, and a range of lettuces, among other super fresh offerings. The fourth-generation farmer mused about picking beans at just 12 years old (he and his brother, Ryan, would taking turns throwing pebbles at the outhouse when they needed a break from the work). After serving up a fresh green juice shot, Talley showed our group of desk-loving writers just how to pick a French green bean: Gently tug on the top of the pod while leaving the stem-like cap intact. Although the beans aren’t what Talley called his “iconic” veggies that are sought after most—like summer corn; avocados; and bumpy, multi-hued heirloom tomatoes—there is a simple, zen-like pleasure in harvesting them all the same. After crunching into a plate of the veggies I had picked just moments before, I was awash in gratitude for the thought, care, and effort that goes into the harvest of a single green bean or pinot noir grape. How can we fully embrace—and enjoy—each harvest as it comes? My suggestion: Season it, share it, and always pass it on.